With over 1,700 sold already, 526 of them to Euro6 specification (including 194 Euro6 for the UK), Volvo is leading the way among manufacturers in the supply of hybrid buses. 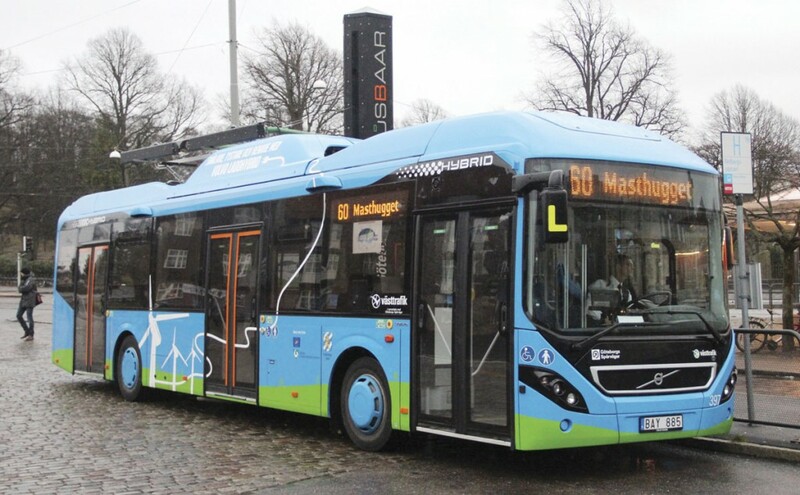 At the beginning of the year (B&CB issue 1260, 24 January 2014) we reported from Sweden on three prototype buses running in service in Gothenburg that took the hybrid concept on to the next stage. At the time Volvo referred to them as Plug-In Hybrids but it now prefers to call them Electric Hybrids. The name change from Plug-In Hybrid does not indicate that the buses never require plugging in to the grid a, low level overnight plug in is still required for battery balancing purposes. 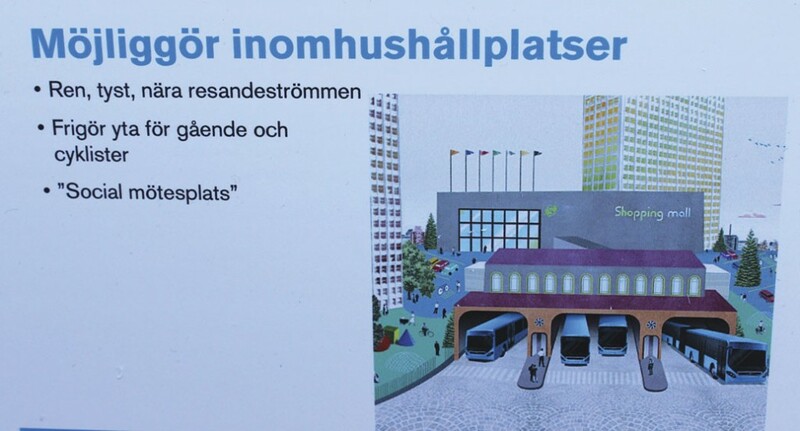 In Gothenburg the project went beyond the hybrids we have seen thus far in the UK, adding opportunity charging at charging stations located at each end of the route, maximising the zero emission range of buses which retain a diesel engine. Now Volvo is going a further step down the electric hybrid route with a new trial in Gothenburg scheduled to start in June next year, one week before the finish of the Volvo Ocean Race in the same city. This will add the ability to geo-fence zero emissions operation to ensure that the bus is emitting nothing harmful in those areas of the city where air quality issues are most critical. Last week I visited Gothenburg again, one of a number of visits I’ll be making, to see the latest developments and hear more about Volvo’s other plans for a future focused on Electromobility. Jessica Sandström, Senior Vice President City Mobility for Volvo Buses, explained that Volvo’s strategy was one of electrification. Having been the first of the major manufacturers to adopt environmental care as a core value (alongside quality and safety) as early as 1971, it has now set its sights on becoming the world leader in sustainable transport solutions by: creating value for customers in selected segments; pioneering products and services for the transport and infrastructure industries; driving quality, safety and environmental care; and working with energy, passion and respect for the individual. She explained that, as well as being sustainable, silent, reliable, attractive and closer to passengers, tomorrow’s transport would be a means of raising the profile of a progressive city. 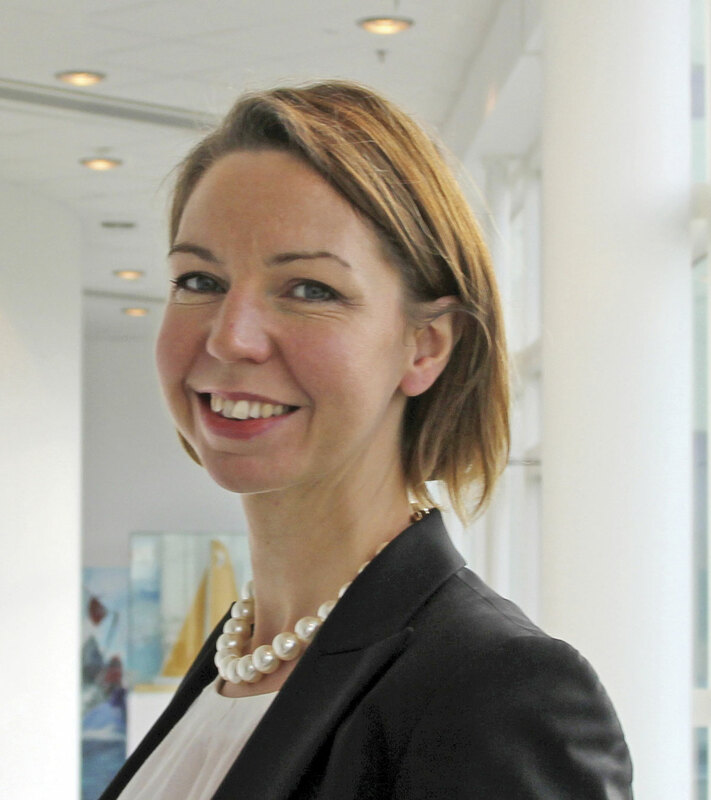 She foresaw a new project approach to buying public transport which would involve manufacturers negotiating with a number of stakeholders, not just the operator. This started with the local Mayor as the decision maker and included the local transport authority, the energy authority, the street authority and also local electricity supplier or grid operator as well as the bus operating company. In terms of vehicles, over 40% of operators, authorities and municipalities surveyed by the EU thought they would be likely to be buying more electric buses in future, which is more than thought they would be staying with diesel and three times as many as said they would be buying gas. For Volvo energy efficiency was at the heart of their electrification strategy and electricity was the most energy efficient fuel source, it was three times more fuel efficient than gas and bus systems were suitable for electrification. It was already offering hybrids, which delivered a 30-40% fuel use reduction, silent starting and 40% lower on-road emissions and was now introducing hybrid electrics which, with a six-minute charge at each end of a route, gave a 75% fuel and 60% energy saving, a 75% CO2 reduction (using CO2 neutral electricity) and the ability to drive 70% of a route silently and locally emission free. In the longer term, fully electric buses with the same six minute charge at each end of a route would give an 80% energy reduction, silent electric drive for the entire route, no local exhaust emissions and a 99% CO2 reduction (using CO2 neutral electricity). It was anticipated that different solutions would be employed in different areas with full electrics in city centres, electric hybrids in more suburban roles, hybrid intercity buses and the probability that coaches would remain diesel powered. Volvo had already signed memorandums of understanding with seven cities worldwide. These were: Gothenburg, Stockholm, Hamburg, Luxembourg, Curitiba, Montreal, and most recently, Edinburgh, with others likely to follow. 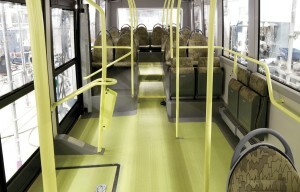 Electric Hybrid buses, as unveiled at the IAA exhibition, would commence operation in Hamburg on 18 December. Within Gothenburg, as part of the Hyperbus project, there had been the three-bus, 10,000 operating hour, hybrid electric programme. That had successfully ended in the summer although one of the three vehicles was continuing to run on the route. One of the others had been converted to diesel and the third was currently being used for exhibition/research purposes. Johan Larsson, City Mobility Program Director for Volvo Buses, explained that Gothenburg was a forward thinking, innovative, city that wanted to be an arena for testing new products of all kinds, including buses. Volvo and Gothenburg shared a common vision. The ElectriCity project, which is entirely commercial and not in receipt of EU funding, started with six stakeholder partners and that number had now grown to 13. The objectives were to: create an innovative electrified bus system as part of the city’s public transport system; to develop and test new services and products that contribute to a more attractive public transport system; to develop, through the ElectriCity partnership, working methods for demonstration projects between public and private partners; and to produce new business models for sustainable mobility in the city that can be up-scaled and replicated elsewhere. The next stage is to be the launch, on 14 June 2015, of a completely new route using seven electric hybrids and three Volvo full electric buses. It will have a PVR of seven buses and provide a 10-minute frequency. 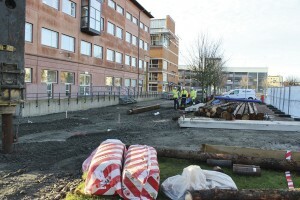 Scheduled to operate for three years, with constant updating and development throughout, the 7.69km route will run between the Lindholmen Science Park and the main Chalmers University of Technology site on opposite sides of the Gota River, passing through the main central street of Gothenburg, known as the Avenue, and taking advantage of several stretches of BRT standard segregated roadway. 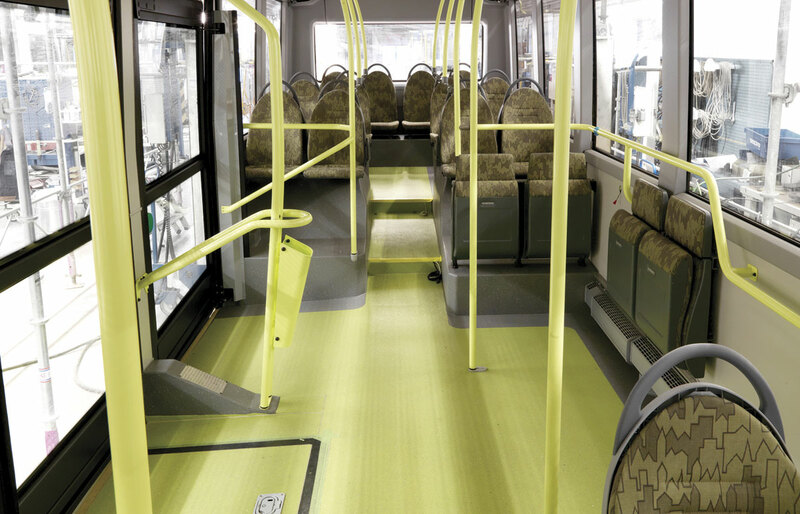 Both types of vehicle will require charging facilities at each end of the route and both will be able to use the same charging stations which are integrated within the bus stop environment. A change from the earlier electric hybrids used is that only the charging station will have a moving charging arm that lowers to meet a plate on the bus, rather than the previous system that had a connection raised from the bus. Extensive use will be made of IT management tools with systems developed to cover zone management, charging management, yard management and traffic management. 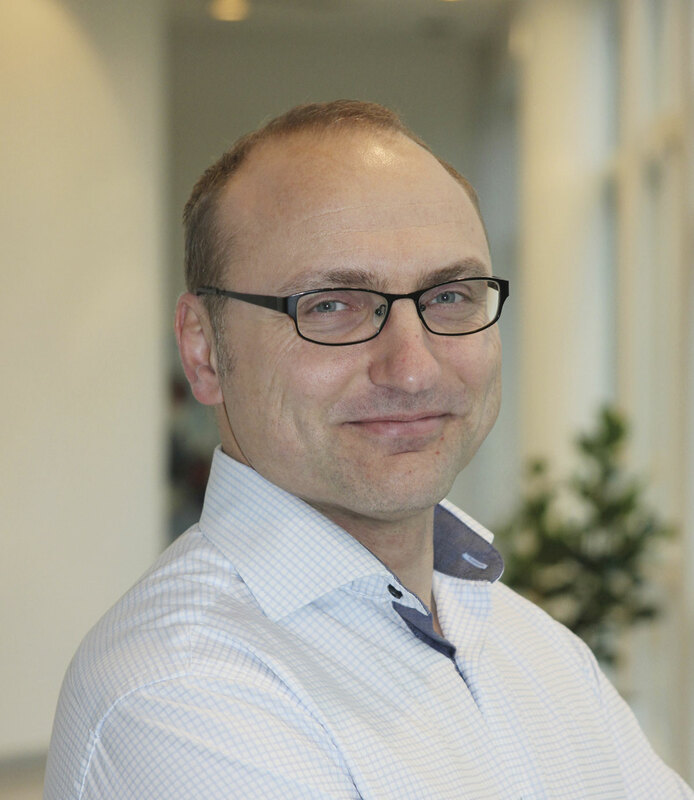 An aspect that Volvo will be specifically involved in will be a next generation workshop concept to develop the competence and equipment to maintain electric vehicles, including new maintenance and repair processes for electromobility. A modern workshop environment is needed to attract the next generation of mechanics/electricians. Given the importance of making buses attractive and accessible to passengers, an aspect of the project will see five new bus stops created offering new features. 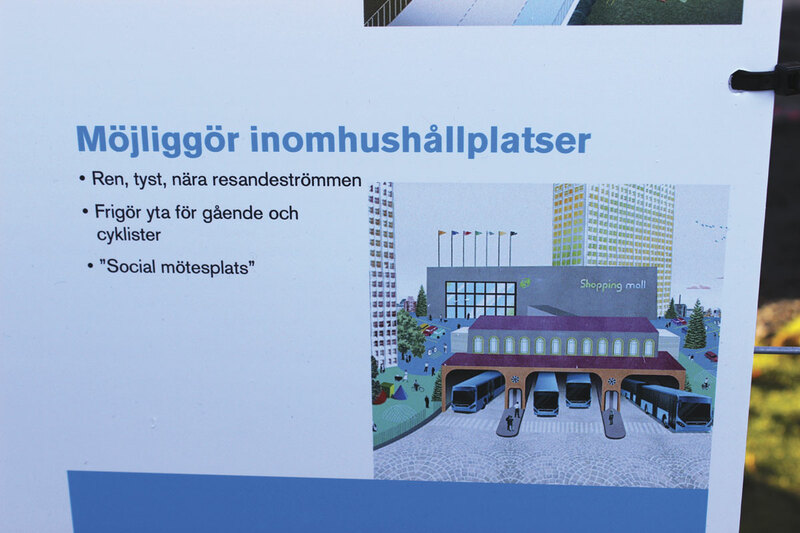 One of these, at the Lindholmen Science Park, will be an indoor stop where the vehicle enters the building to collect passengers. It will be adjacent to a waiting area with café. Information provision will be both location and passenger specific. Passenger services, particularly those requiring connectivity, will be increased in order to give seamless journeys. The same network will provide connectivity at stops and on vehicles so such services are not interrupted. We are used to hearing complaints about vehicle emissions focused on the gases and particles that come out of the tailpipe but Janos Turcsany, Group Manager Feature & NVH (Noise, Vibration & Harshness) for Volvo Bus, pointed out that the World Health Organisation (WHO) recognised that, after air pollution, traffic noise is the second most serious environmental issue in the EU. Noise had an impact not only on individuals but on the economic welfare of cities. Around 30% (152m people) of the EU population is exposed to traffic noise above the recommended level and one in five is regularly exposed to traffic noise of greater than 55dB(A) outdoors at night. Physical effects of this on humans included higher blood pressure and an increased risk of heart attacks and cardio vascular problems. It also incurred increased costs in the erection of buildings which had to have their specifications increased to counter the impact of noise. A number of remedies were available to reduce noise, including limiting speeds and traffic volume. The EU had a number of projects underway including Q-zones, into which only LNVs (low noise vehicles) were allowed. Electric buses offered significant benefits in lower noise levels, particularly at junctions and bus stops where their advantage over diesel and gas buses was considerable. The biggest advantage to humans was in their lower noise levels at night. It was pointed out that once a vehicle reaches 60-70kph the major source of noise is the tyres. There were two other issues. 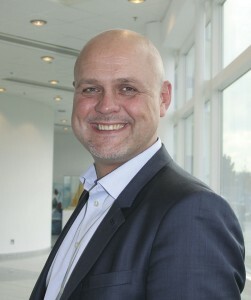 One was that currently the legislation makes no differentiation between an electric bus and any other bus, counting both as heavy vehicles, and secondly, electric buses are so quiet that there is talk of the need to make them emit some form of noise so that people are aware of their presence in potentially dangerous situations. In the prototype workshop at the Arendal headquarters of Volvo Bus, it was explained that the development of three new electric concept buses is being undertaken on three sites: Arendal, the Saffle facility in Northern Sweden and Wroclaw in Poland. All are being assembled at Saffle using the expertise of the team in the refurbishment workshop there. The buses are then taken to Arendal for final build and start up. 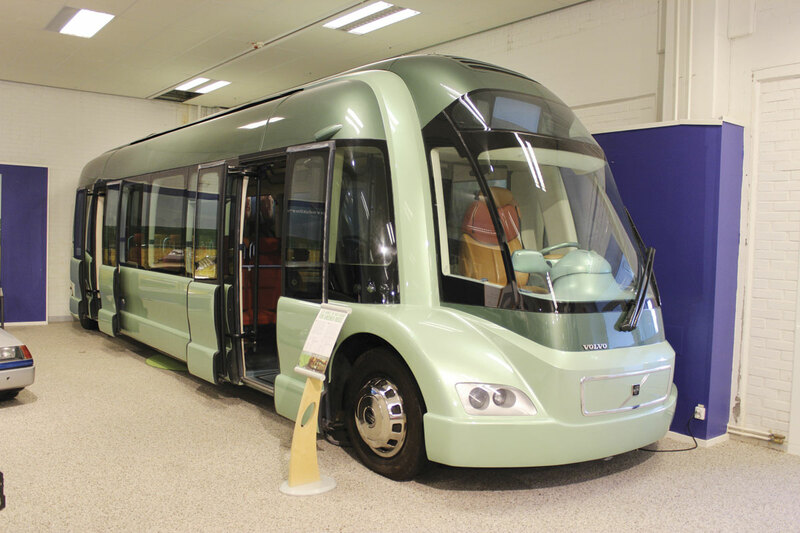 In the prototype workshop we were shown the first of these electric buses, which will operate on the ElectriCity project in Gothenburg, though we were not permitted to take pictures. In an advanced stage of build but yet to be fully completed, it was something of a surprise in that the appearance is different to that of the current 7900 range and, following experience with the demonstration prototype developed for the European Bus System of the Future (EBSF) project, has no front entrance door but two full width doors alongside each other in the centre, within a 7.0m wheelbase. The A-pillar arrangement echoes that of the truck range, but the appearance is not truck like. A further surprise is that it is only 10.7m rather than 12m long and has two shallow steps up to the rear seating area where 16 of the 29 seats (including nine tip-ups) are located. The shorter length is accomplished through a central driving position, between the front wheels, overcoming the issue of what to do with the front wheelboxes within the low floor environment. There was a recess in the front panel for an LED backlit representation of the Volvo ‘Iron mark’ emblem and the destination display were also new LED units. An unusual feature was the use of a water repellent finish on the windscreen that will last at least two years. As part of the ElectriCity project tests will be carried out to determine whether the coating can last the lifetime of the unit and the extent to which it can contribute to energy efficiency and financial savings by a lessened requirement for wiping and de-icing. In addition to the standard heating system, a heat exchanger has been added, integrated with the driver heating system. With safety and the well being of the driver in mind, there is an auxiliary multi-fuel (electric/fuel) heater unit running on HVO hydrogenated fuel rather than bio diesel when in fuel mode. A high capacity Wi-fi system is installed along with five double socket i-pad charging points and there will also be eight LCD screens for passenger infotainment purposes. Ceiling lighting is LED as are under-seat lights, and all of the external lighting units except the headlights and cornering units. Maximum passenger capacity is 85 people, with only 29 seats of which nine are tip-ups. Another EBSF inspired feature is driver-controlled locking of the tip-up seats to ensure maximum standing space is available at peaks. Describing the driveline, Chief Product Manager GTT, Fredrika Berndtsson, said the electric motor was low mounted at the rear. A purchased unit, it has a peak output of 160kW and a continuous rating of 105kW. The gearbox is a new two-speed unit designed in house by AB Volvo drawing on I-Shift technology. The complete driveline (excluding batteries) weighs 180kg. 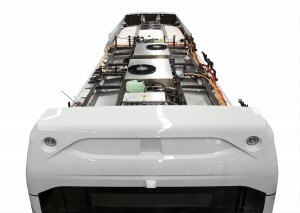 Driving the motor is electricity from four roof mounted batteries, each weighing 350kg. Each Lithium-Ion battery is identical to the single unit used on the 7900 Electric Hybrid and has the same part number. Charging takes six minutes and this input is boosted by regenerative braking. It is possible for the bus to run for 16 hours a day giving it a notional peak range of around 400km. Technically, it can be driven at up to 70kmh and it was said that performance is a diesel would be, though 80% more energy efficient. 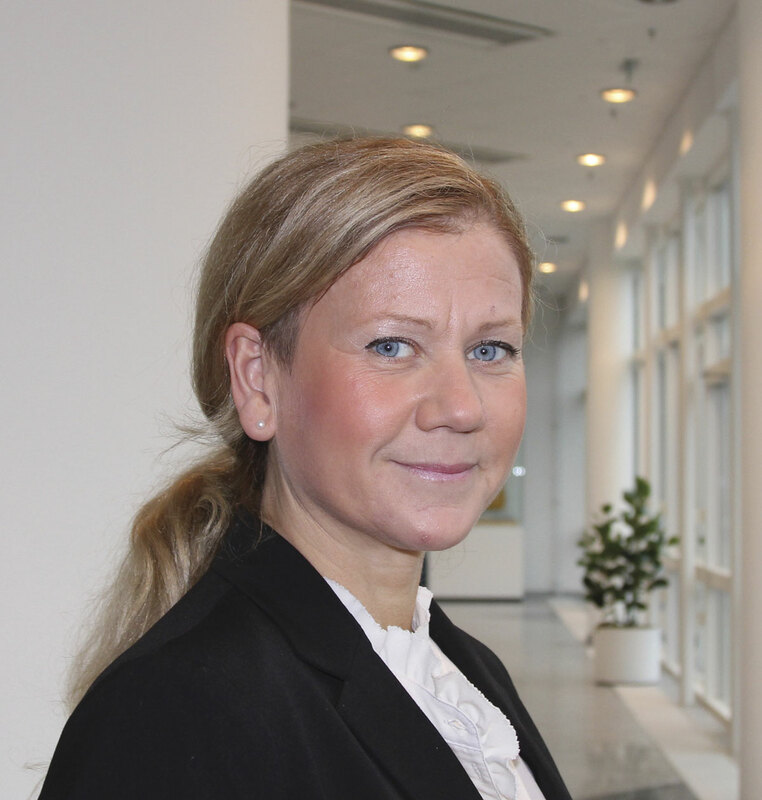 ‘We hope to be the best in the world in energy efficiency,’ said Fredrika. Apparently, the batteries account for around 80% of the driveline cost. They are heated, a system that needs to be plugged in at night to maintain their condition and ability to operate optimally. Customers will be charged on a per/km basis and after the batteries reach the end of their working lives the manufacturer will remanufacture them. I understand that the calculations are based on 60,000km a year and a six year life. The total weight of the bus is predicted to be between 11.6 and 11.8-tonnes. When parking at the charging station, there is a tolerance in each direction of around 0.5m. Both the electric and electric hybrid operate in the same way. Once the bus and the charging system indicate that they are both ready, a pantograph lowers from the charging station making contact with the plate on the roof. Security checks are made and if these are satisfied charging begins. Apparently the target for the pantograph lowering is six seconds, though this has yet to be achieved. For charging to take place the parking brake must be applied. 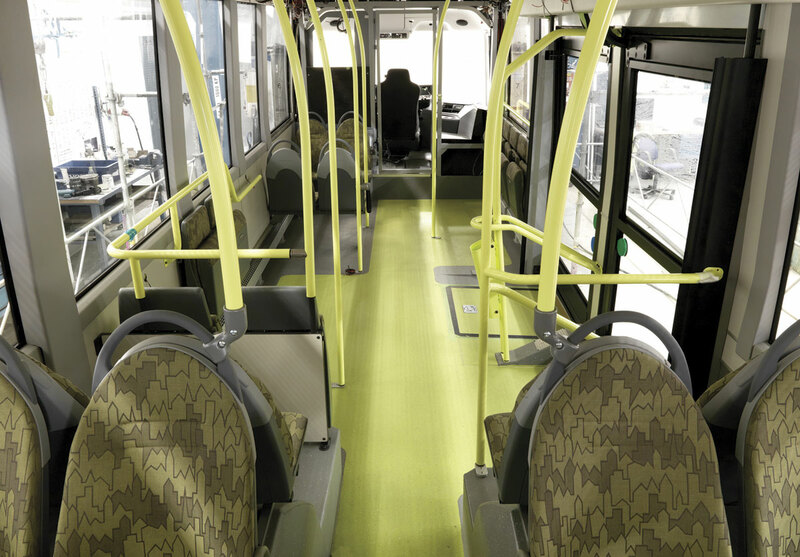 There is no requirement for passengers to leave the bus during the process. Approximately, one minute of charging equates to 2km of driving. Should the driver mistakenly drive away before the charging process is complete, the system is failsafe, the pantograph is spring-loaded and will retract, so there would not be an issue. At night, the pantograph system used at the termini is not needed; there is a 400-volt cable connection instead. Supply of the charging stations is not limited to one manufacturer. Siemens will supply the equipment for Stockholm, Hamburg and Gothenburg, whereas ABB will supply Luxembourg. Who pays for the charging station may differ according to location but throughout Scandinavia the electric utility company will do it. In Hamburg the local authority bus fleet owners also run the utility company. As previously stated, the full electrics will run alongside hybrid electrics. 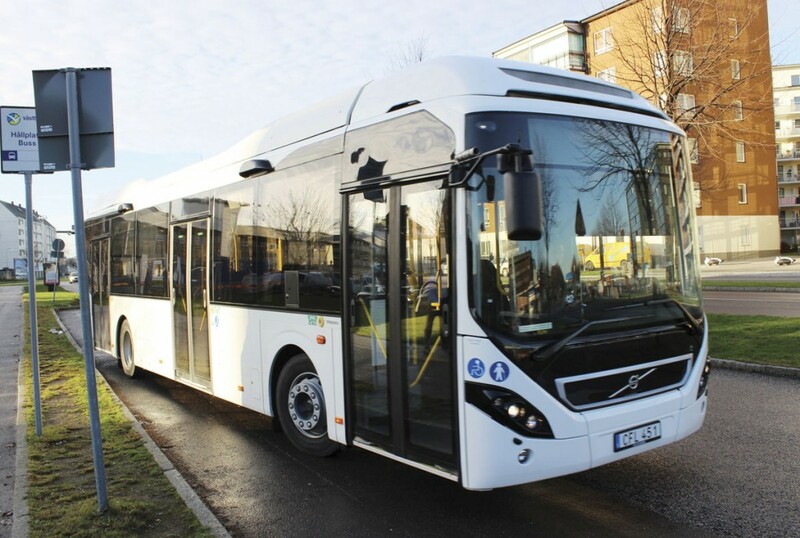 To demonstrate the electric hybrid in service, as well as the geo-fencing (Zone Management) capability, we boarded a white painted 7900 Electric Hybrid and travelled from the Volvo Buses workshops at Arendal to the Lindholmen area. The opportunity to travel on it showed what a difference the revised engine installation arrangements coupled with the Euro6 engine itself makes compared to the Euro5 engined Electric Hybrids that I experienced in Gothenburg last year. It demonstrated none of the harsh vibration that was a characteristic of the Euro5, even when sat in the seats adjacent to the D5B engine at the offside rear. At the beginning of each day, or during the day if the bus changes to a different route, the driver contacts the headquarters to assign the bus to a specific route, a process that downloads the route specific geo-fencing parameters from a portal to the vehicle by means of telematics. 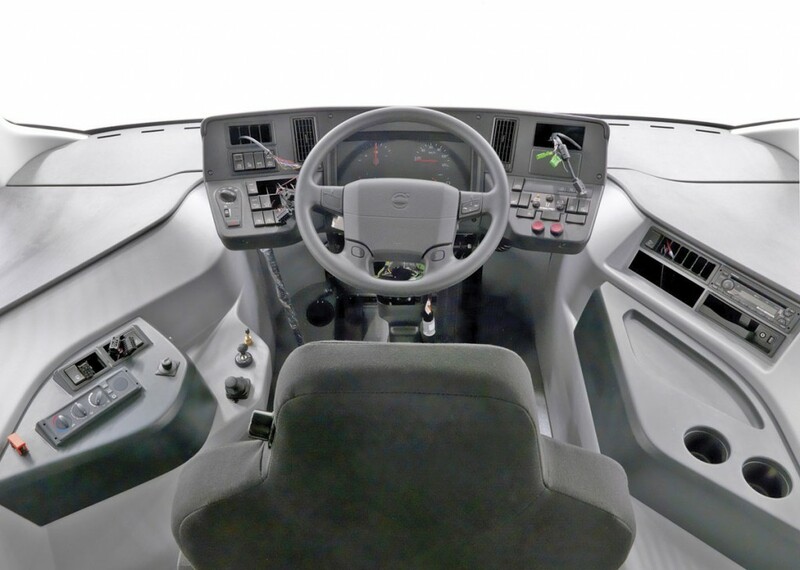 As the bus enters a zone or passes between zones the change is seamlessly smooth, the cutting in or out of the diesel engine providing the only indication that the change has taken place. On some occasions, on our trip it was towards the end of the journey, the engine did not cut in as we entered a new zone because the power management system had determined that there was energy in the batteries that could be used without compromising the vehicle’s ability to run in zero emission mode where required to do so. Close to a part of Chalmers University at Lindholmen (not the main Chalmers site which is at the other end of the route), we disembarked from the bus and saw construction work underway on the covered bus stop and its waiting room. A single bay stop, it will provide a comfortable environment for passengers once complete. As it is a largely pedestrianised area there will be lights and sound to warn the public that the bus is present. Just round the corner from the stop is another pick up point which does not have its own waiting area but makes use of an existing facility. Here, potential users will know to leave the waiting area because an announcement will automatically be triggered when the bus leaves the previous stop. It can be very cold in Gothenburg so you don’t want to be standing around in the cold unnecessarily. The formal presentations were made in conference rooms at the Volvo Museum next to a sea so calm that the wind turbines were motionless. I only had a brief opportunity to look around the museum on this occasion and there in a corner was the Volvo Environmental Concept Bus of 1995. It was powered by a gas turbine but even at this stage the possibility of a fully electric driveline was envisaged. Other features shared with the latest generation of innovations included the centre driving position and 10.7m length though the 8.4m wheelbase was radically different. Also in the museum was a metallic blue painted B10M chassis. It wouldn’t offer the current emission levels but I’m sure operators would be delighted to purchase them today were they still available. It is always interesting to be involved during the early stages of projects that signal the way ahead for the bus industry, and the holistic approach Volvo is taking with its partners made this a thought provoking trip on many levels. It is clear that the vehicle we saw is to a very Gothenburg-specific specification with elements that you will not expect to be carried over to the standard offering, but it shows a great deal of what Volvo is thinking. In the coming months we’ll be keeping you up to date with developments on this story as Volvo continues to develop its products for an electric future. Incidentally, of that figure of over 1,700 Volvo hybrids sold, the market taking more than any other is the UK. You might not guess the second largest customer – it’s Columbia.